For the river in Bangladesh, see Jamuna River (Bangladesh). For other uses, see Yamuna (disambiguation). The Yamuna (Hindustani: pronounced [jəmʊnaː]), also known as the Jumna or Jamuna (not to be mistaken with the Jamuna of Bangladesh), is the second largest tributary river of the Ganges (Ganga) and the longest tributary in India. Originating from the Yamunotri Glacier at a height of 6,387 metres (20,955 ft) on the southwestern slopes of Banderpooch peaks of the Lower Himalaya in Uttarakhand, it travels a total length of 1,376 kilometres (855 mi) and has a drainage system of 366,223 square kilometres (141,399 sq mi), 40.2% of the entire Ganges Basin. It merges with the Ganges at Triveni Sangam, Prayagraj (Allahabad), which is a site of the Kumbh Mela, a Hindu festival held every 12 years. Madan Mohan temple, on the Yamuna at Vrindavan in Uttar Pradesh, 1789: the river has shifted further away since then. It crosses several states: Haryana and Uttar Pradesh, passing by Uttarakhand and later Delhi, and meeting its tributaries on the way, including Tons, its largest tributary, Chambal, its longest tributary which has its own large basin, followed by Sindh, the Betwa, and Ken. From Uttaranchal, the river flows into the state of Himachal Pradesh. After passing Paonta Sahib, Yamuna flows along the boundary of Haryana and Uttar Pradesh and after exiting Haryana it continues to flow till it merges with the river Ganga (Ganges) at Sangam or Prayag in Allahbad (Uttar Pradesh). It helps create the highly fertile alluvial Yamuna-Ganges Doab region between itself and the Ganges in the Indo-Gangetic plain. Nearly 57 million people depend on the Yamuna's waters. With an annual flow of about 10,000 cubic billion metres (cbm; 8.1 billion acre⋅ft) and usage of 4,400 cbm (of which irrigation constitutes 96 per cent), the river accounts for more than 70 per cent of Delhi's water supply. Like the Ganges, the Yamuna is highly venerated in Hinduism and worshipped as the goddess Yamuna. In Hindu mythology she is the daughter of the Sun Deva, Surya, and the sister of Yama, the Deva of Death, hence also known as Yami. According to popular legends, bathing in its sacred waters frees one from the torments of death. At the Hathni Kund Barrage, its waters are diverted into two large canals: the Western Yamuna Canal flowing towards Haryana and the Eastern Yamuna Canal towards Uttar Pradesh. Beyond that point the Yamuna is joined only by the Somb, a seasonal rivulet from Haryana, and by the highly polluted Hindon River near Noida, so that it continues only as a trickling sewage-bearing drain before joining the Chambal at Pachnada in the Etawah District of Uttar Pradesh. The water of Yamuna is of "reasonably good quality" through its length from Yamunotri in the Himalayas to Wazirabad barrage in Delhi, about 375 kilometres (233 mi); below this, the discharge of wastewater through 15 drains between Wazirabad barrage and Okhla barrage renders the river severely polluted. The present Sarsuti river which originates in the Shivalik hills in Himachal and Haryana border and merges with Ghaggar River near Pehowa is the palaeochannel of Yamuna. Yamuna changed its course to the east due to a shift in the slope of the earth's crust caused by plate tectonics. The source of Yamuna lies in the Yamunotri Glacier at an elevation of 6,387 metres (20,955 ft), on the south-western slopes of Banderpooch peaks, which lie in the Mussoorie range of the Lower Himalayas, north of Haridwar in Uttarkashi district, Uttarakhand. Yamunotri temple, a shrine dedicated to the goddess Yamuna, is one of the holiest shrines in Hinduism, and part of the Chota Char Dham Yatra circuit. Also standing close to the temple, on its 13-kilometre (8 mi) trek route that follows the right bank of the river, lies Markendeya Tirtha, where the sage Markandeya wrote the Markandeya Purana. From Markendeya Tirtha, the river flows southwards for about 200 kilometres (120 mi), through the Lower Himalayas and the Shivalik Hills Range. Morainic deposits are found along the steep Upper Yamuna, highlighted with geomorphic features such as interlocking spurs, steep rock benches, gorges and stream terraces. Large terraces formed over a long period of time can be seen in the lower course of the river, such as those near Naugoan. An important part of its early catchment area, totalling 2,320 square kilometres (900 sq mi), lies in Himachal Pradesh. The Tons, Yamana's largest tribuary, drains a large portion of the upper catchment area and holds more water than the main stream. It rises from the Hari-ki-dun valley and merges after Kalsi near Dehradun. The drainage system of the river stretches between Giri-Sutlej catchment in Himachal and Yamuna-Bhilangna catchment in Garhwal, also draining the ridge of Shimla. Kalanag (6,387 metres [20,955 ft]) is the highest point of the Yamuna basin. Other tributaries in the region are the Giri, Rishi Ganga, Kunta, Hanuman Ganga and Bata, which drain the upper catchment area of the Yamuna basin. From the upper catchment area, the river descends onto the plains of Doon Valley, at Dak Pathar near Dehradun. Flowing through the Dakpathar Barrage, the water is diverted into a canal for power generation. Further downstream, the Assan River joins the Yamuna at the Asan Barrage, which hosts a bird sanctuary. After passing the Sikh pilgrimage town of Paonta Sahib, the Yamuna reaches Tajewala in Yamuna Nagar district (named after the river) of Haryana. A dam built here in 1873 is the origin of two important canals, the Western and Eastern Yamuna Canals, which irrigate the states of Haryana and Uttar Pradesh. The Western Yamuna Canal (WYC) crosses Yamuna Nagar, Karnal and Panipat before reaching the Haiderpur treatment plant, which contributes to Delhi's municipal water supply. The Yamuna receives wastewater from Yamuna Nagar and Panipat cities; beyond this it is replenished by seasonal streams and groundwater accrual. During the dry season, the Yamuna remains dry in many stretches between the Tajewala dam and Delhi, where it enters near the Palla barrage after traversing 224 kilometres (139 mi). 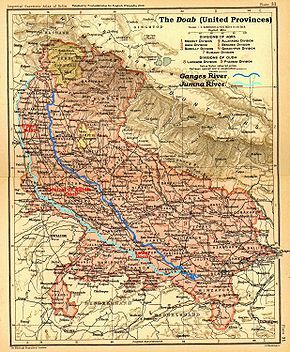 The Yamuna defines the state borders between Himachal Pradesh and Uttarakhand, and between Haryana, Delhi and Uttar Pradesh. When the Yamuna reaches the Indo-Gangetic plain, it runs almost parallel to the Ganges, the two rivers creating the Ganges-Yamuna Doab region. Spread across 69,000 square kilometres (27,000 sq mi), one-third of the alluvial plain, the region is known for its agricultural output, particularly for the cultivation of basmati rice. The plain's agriculture supports one-third of India's population. Subsequently, the Yamana flows through the states of Delhi, Haryana and Uttar Pradesh] before merging with the Ganges at a sacred spot known as Triveni Sangam in Prayagraj (Allahabad). Pilgrims travel by boats to platforms erected in midstream to offer prayers. During the Kumbh Mela, held every 12 years, large congregations of people immerse themselves in the sacred waters of the confluence. The cities of Baghpat, Delhi, Noida, Mathura, Agra, Firozabad, Etawah, Kalpi, Hamirpur, and Prayagraj lie on its banks. At Etawah, it meets it another important tributary, Chambal, followed by a host of tributaries further down, including, Sindh, the Betwa, and Ken. Tons River, Yamuna's largest tributary, which rises in the 6,315-metre-high (20,719 ft) Bandarpoonch mountain, and has a large basin in Himachal Pradesh. It meets Yamuna below Kalsi near Dehradun, Uttarakhand. Hindon River, which originates in the Saharanpur District, from Upper Shivalik in the Lower Himalayan Range. It is entirely rainfed and has a catchment area of 7,083 square kilometres (2,735 sq mi), traverses 400 kilometres (250 mi) through Muzaffarnagar District, Meerut District, Baghpat District, Ghaziabad, Noida and Greater Noida, before joining Yamuna just outside Delhi. Ken River, which flows through the Bundelkhand region of Madhya Pradesh and Uttar Pradesh. It originates near Ahirgawan village in Jabalpur district and travels a distance of 427 kilometres (265 mi) before merging with the Yamuna at Chilla village, near Fatehpur in Uttar Pradesh. It has an overall drainage basin of 28,058 square kilometres (10,833 sq mi). Chambal River, known as Charmanvati in ancient texts, which is Yamuna's longest tributary. It flows through Rajasthan and Madhya Pradesh and traverses a total distance of 960 kilometres (600 mi) from its source in Vindhya Range, near Mhow. With a drainage basin of 143,219 square kilometres (55,297 sq mi), it supports hydro-power generation at Gandhi Sagar dam, Rana Pratap Sagar dam and Jawahar Sagar dam, before merging into the Yamuna south east of Sohan Goan, in Etawah district. Sindh River, which joins the Yamuna shortly after the Chambal. Sasur Khaderi River, a.k.a. Sasur Khaderi, which is a tributary in Fatehpur district. 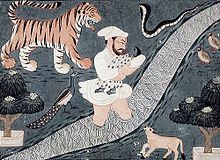 Vasudev carrying baby Lord Krishna across the Yamuna, an important legend of Bhagavata Purana. The name Yamuna seems to be derived from the Sanskrit word "yama", meaning 'twin', and it may have been applied to the river because it runs parallel to the Ganges. The Yamuna is mentioned at many places in the Rig Veda, which was composed during the Vedic period c. 1700–1100 CE, and also in the later Atharvaveda, and the Brahmanas including Aitareya Brahmana and Shatapatha Brahmana. In the Rigveda, the story of the Yamuna describes her "excessive love" for her twin, Yama, who in turn asks her to find a suitable match for herself, which she does in Krishna. The tale is further detailed in the 16th century Sanskrit hymn, Yamunashtakam, an ode by the philosopher Vallabhacharya. Here the story of her descent to meet her beloved Krishna and to purify the world has been put into verse. The hymn also praises her for being the source of all spiritual abilities. And while the Ganges is considered an epitome of asceticism and higher knowledge and can grant Moksha or liberation, it is Yamuna, who, being a holder of infinite love and compassion, can grant freedom, even from death, the realm of her elder brother. Vallabhacharya writes that she rushes down the Kalinda Mountain, and describes her as the daughter of Kalinda, giving her the name Kalindi, the backdrop of Krishna Leela. The text also talks about her water being of the colour of Lord Krishna, which is dark (Shyam). The river is referred to as Asita in some historical texts. It is mentioned as Iomanes (Ioames) in the surveys of Seleucus I Nicator, an officer of Alexander the Great and one of the Diadochi, who visited India in 305 BCE. Greek traveller and geographer Megasthenes visited India sometime before 288 BCE (the date of Chandragupta's death) and mentioned the river in his Indica, where he described the region around it as the land of Surasena. In Mahabharata, the Pandava capital of Indraprastha was situated on the banks of Yamuna, considered to be the site of modern Delhi. 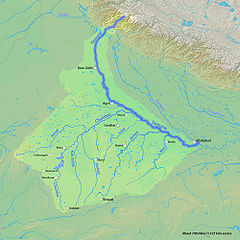 Geological evidence indicates that in the distant past the Yamuna was a tributary of the Ghaggar River (identified by some as the Vedic Sarasvati River). It later changed its course eastward, becoming a tributary of the Ganges. While some have argued that this was due to a tectonic event, and may have led to the Sarasvati River drying up, the end of many Harappan civilisation settlements, and creation of the Thar desert, recent geological research suggests that the diversion of the Yamuna to the Ganges may have occurred during the Pleistocene, and thus could not be connected to the decline of the Harappan civilisation in the region. Most of the great empires which ruled over a majority of India were based in the highly fertile Ganges–Yamuna basin, including the Magadha (c. 600 BCE), Maurya Empire (321–185 BCE), Shunga Empire (185–73 BCE), Kushan Empire (1st–3rd centuries CE), and Gupta Empire (280–550 CE), and many had their capitals here, in cities like Pataliputra or Mathura. These rivers were revered throughout these kingdoms that flourished on their banks; since the period of Chandragupta II (r. 375–415 CE), statues both the Ganges and Yamuna became common throughout the Gupta Empire. Further to the South, images of the Ganges and Yamuna are found amidst shrines of the Chalukyas, Rashtrakutas (753–982), and on their royal seals; prior to them, the Chola Empire also added the river into their architectural motifs. The Three River Goddess shrine, next to the Kailash rock-cut Temple at Ellora, shows the Ganges flanked by the Yamuna and Saraswati. The goddess of the river, also known as Yami, is the sister of Yama, the god of death, and the daughter of Surya, the Sun god, and his wife Saranyu. Yamuna, referred to respectfully as Yamunaji, holds a very important position in Pushti Marga, a large sect of Hinduism based on the ShuddhAdvaita, in which Shri Krishna is the main deity, propagated by VallabhAcharya / MahaPrabhuji. The river Yamuna is connected to the religious beliefs surrounding Krishna and various stories of the two are found in Hindu religious texts, especially the Puranas. One such story is Kaliya Daman about the subduing of Kaliya, a Nāga which had inhabited the river and terrorised the people of Braja. Yamuna, according to the legends, is closely related to Lord Krishna and Mahabharata. Krishna was taken across the Yamuna on the night of his birth. Krishna's maternal uncle Kansa had planned to kill all his nephews, as his eighth nephew was predicted to be his Kāla. When Vasudeva, carrying Krishna in a basket, reached the river Yamuna, on the stormy night of Krishna's birth, Yamuna is said to have parted to make way for Vasudeva. Krishna and the Gopis also used to play on the banks of the Yamunaji as children. Taj Mahal is situated on the banks of river Yamuna. The stretch of the river from its origin at Yamunotri to Okhla barrage in Delhi is called "Upper Yamuna". A Memorandum of Understanding (MoU) was signed amongst the five basin states (Himachal Pradesh, Uttar Pradesh, Uttarakhand, Haryana, Rajasthan, and Delhi) on 12 May 1994 for sharing of its waters. This led to the formation of Upper Yamuna River Board under India's Ministry of Water Resources, whose primary functions are: regulation of the available flows amongst the beneficiary states and monitoring the return flows; monitoring conservation and upgrading the quality of surface and groundwater; maintaining hydro-meteorological data for the basin; overviewing plans for watershed management; and monitoring and reviewing the progress of all projects up to and including Okhla barrage. Flood forecasting systems are established at Poanta Sahib, where Tons, Pawar and Giri tributaries meet. The river take 60 hours to travel from Tajewala to Delhi, thus allowing a two-day advance flood warning period. The Central Water Commission started flood-forecasting services in 1958 with its first forecasting station on Yamuna at Delhi Railway Bridge. Dakpathar Barrage in Uttarakhand, managed by the Uttarakhand govt. Hathni Kund Barrage in Haryana, 172 km (107 mi) from the source of Yamuna, built in 1999 and managed by Haryana govt. Tajewala Barrage was built in 1873 and replaced by the Hathni Kund. Wazirabad barrage in north Delhi, 244 km (152 mi) from Hathni Kund barrage, managed by the Delhi govt. "New Wazirabad barrage", proposed in 2013, to be built 8 km north of the Wazirabad barrage. ITO barrage (Indraparstha barrage) in central Delhi, managed by the Haryana govt. Okhla barrage is 22 km from Wazirabad to south Delhi, managed by the Uttar Pradesh (UP) government. New Okhla Barrage, a new barrage, managed by the UP govt. Palla barrage downstream on "Delhi-Faridabad canal" in Haryana, managed by the Haryana govt. Gokul barrage (a.k.a. Mathura barrage) is at Gokul in Uttar Pradesh, managed by the UP govt. Agra Canal headworks at Okhla barrage, Delhi, 1871. Use of the Yamuna's waters for irrigation in the Indo-Gangetic Plains is enhanced by its many canals, some dating to the 14th century Tughlaq dynasty, which built the Nahr-i-Bahisht (Paradise) parallel to the river. The Nahr-i-Bahisht was restored and extended by the Mughals in the first half of the 17th century, by engineer Ali Mardan Khan, starting from Benawas where the river enters the plains and terminating near the Mughal capital of Shahjahanabad, the present city of Delhi. As the Yamuna enters the Northern Plains near Dakpathar at an elevation of 790 metres (2,590 ft), the Eastern Yamuna Canal commences at the Dakpathar Barrage and pauses at the Asan and Hathnikund Barrages before continuing south. The Western Yamuna Canal (WYC) was built in 1335 CE by Firuz Shah Tughlaq. Excessive silting caused it to stop flowing c. 1750, when the British Raj undertook a three-year renovation in 1817 by Bengal Engineer Group. The Tajewala Barrage dam was built in 1832–33[timeframe?] to regulate the flow of water, and was replaced by the modern Hathni Kund Barrage in 1999. The main canal is 86 kilometres (53 mi) long. When including its branches and many major and minor irrigation channels, it has a total length of 325 km (202 mi) The WYC begins at the Hathni Kund Barrage about 38 kilometres (24 mi) from Dakpathar and south of Doon Valley. The canals irrigate vast tracts of land in the region in Ambala, Karnal, Sonepat, Rohtak, Jind, Hisar and Bhiwani districts. Agra Canal, built in 1874, which starts from the Okhla barrage beyond the Nizamuddin bridge, joining the Banganga river about 32 kilometres (20 mi) below Agra. During the dry summer season, the stretch above Agra resembles a minor stream. Munak canal, built in 1819 and renovated in 2008, originates at Munak in Karnal district and extends 22 kmto Delhi, carrying 20 m3/s (700 cu ft/s) of water. Bhalaut Branch, originating at Khubru village, flows through Jhajjar district. Jhajjar Branch, flows through Jhajjar district. Sirsa Branch, the largest branch of the WYC, constructed in 1889–1895. It originates at Indri and meanders through Jind district, Fatehabad district and Sirsa district. Bhiwani Branch, which meanders through Bhiwani district and passes Bidhwan. Hansi Branch, built in 1825 and remodelled in 1959. It originates at Munak and meanders through Hansi tehsil of Hisar district. Sunder Branch, which passes Kanwari in Hisar district. A proposed heavy freight canal, the Sutlej–Yamuna Link (SYL), is being built westwards from near the Yamuna's headwaters through the Punjab region near an ancient caravan route and highlands pass to the navigable parts of the Sutlej–Indus watershed. This will connect the Ganges, which flows to the east coast of the subcontinent, with points west (via Pakistan). When completed, the SYL will allow shipping from India's east coast to the west coast and the Arabian sea, shortening important commercial links for north-central India's large population. The canal starts near Delhi, and is designed to transfer Haryana's share of 4.3 km3 (3,500,000 acre⋅ft) from the Indus Basin. Delhi–Faridabad (Wazirabad barrage to Palla barrage, via ITO barrage), is being developed for passenger and cargo ferry service. New Delhi generates 1,900 million litres (500,000,000 US gal) per day (MLD) of sewage. Though many attempts have been made to process it, these efforts have proven futile. Although the government of India has spent nearly $500 million[clarification needed] to clean up the river, the Yamuna continues to be polluted with garbage while most sewage treatment facilities are underfunded or malfunctioning. In addition, the water in the river remains stagnant for almost nine months a year, aggravating the situation. Delhi alone contributes around 3,296 MLD of sewage to the river. The government of India over the next five years[when?] has prepared plans to rebuild and repair the sewage system and the drains that empty into the river. The last barrage across the Yamuna river is the Mathura barrage at Gokul for supply of drinking water to that city. Downstream of this barrage, many pumping stations are constructed to feed the river water for irrigation needs. These pumping stations are near Pateora Danda 25°55′09″N 80°13′27″E﻿ / ﻿25.91917°N 80.22417°E﻿ / 25.91917; 80.22417, Samgara 25°41′13″N 80°46′27″E﻿ / ﻿25.68694°N 80.77417°E﻿ / 25.68694; 80.77417, Ainjhi 25°43′35″N 80°49′33″E﻿ / ﻿25.72639°N 80.82583°E﻿ / 25.72639; 80.82583, Bilas Khadar 25°31′35″N 81°02′43″E﻿ / ﻿25.52639°N 81.04528°E﻿ / 25.52639; 81.04528, and Samari 25°27′19″N 81°11′43″E﻿ / ﻿25.45528°N 81.19528°E﻿ / 25.45528; 81.19528. Depletion of the base flows available in the river during the non-monsoon months by these pump houses is exacerbating river pollution from Mathura to Prayagraj in the absence of adequate fresh water to dilute the polluted drainage from habitations and industries. In 2009, the Union government announced to the Lok Sabha (Indian Parliament), the failure of the Ganga Action Plan and the YAP, saying that "rivers Ganga and Yamuna are no cleaner now than two decades ago" despite spending over ₹1,700 crore (17 billion rupees) to control pollution. According to a Centre for Science and Environment (CSE) official, these plans adopted the Thames model, based on a centralised sewage treatment system. This meant that a huge sum of money and a 24-hour power supply were needed to manage the treatment plants, while only an 8-hour power supply was available, contributing to the failure. In August 2009, the Delhi Jal Board (DJB) initiated its plan for resuscitating the Yamuna's 22-kilometre (14 mi) stretch in Delhi by constructing interceptor sewers, at the cost of about ₹1,800 crore (18 billion rupees). On 25 April 2014, the National Green Tribunal Act (NGA) recommended the government to declare a 52-kilometre (32 mi) stretch of the Yamuna in Delhi and Uttar Pradesh as a conservation zone. A report prepared by the Ministry of Environment and Forests (MoEF) panel was submitted to the NGA on the same day. Under the Yamuna Action Plan (YAP-I and YAP-II), pollution cleanup of Yamuna was conducted in line with the biological oxygen demand of Yamuna. Under these two phases, 286 schemes, including 39 sewage treatment plants, were completed in 21 towns of Delhi, Uttar Pradesh, and Haryana at a cost of ₹1,453.17 crore (14.5 billion rupees). Sewage treatment capacity of 767.25 million litres per day was created by these efforts. The High Court in the northern Indian state of Uttarakhand ordered in March 2017 that the Ganges and its main tributary, the Yamuna, be assigned the status of legal entities. The rivers would gain “all corresponding rights, duties and liabilities of a living person.” This decision meant that polluting or damaging the rivers is equivalent to harming a person. The court cited the example of the New Zealand Whanganui River, which was also declared to possess full rights of a legal person. This development of environmental personhood has been met with scepticism as merely announcing that the Ganges and Yamuna are living entities will not save them from significant, ongoing pollution. ^ Jain, Sharad K.; Agarwal, Pushpendra K.; Singh, Vijay P. (2007). Hydrology and water resources of India. Springer. p. 341. ISBN 978-1-4020-5179-1. Retrieved 26 April 2011. ^ a b c Jain, Sharad K.; Pushpendra K. Agarwal; Vijay P. Singh (2007). Hydrology and water resources of India—Volume 57 of Water science and technology library. Springer. pp. 344–354. ISBN 1-4020-5179-4. ^ a b c Hoiberg, Dale (2000). Students' Britannica India, Volumes 1-5. Popular Prakashan. pp. 290–291. ISBN 0-85229-760-2. ^ And filthy flows the Yamuna, The Tribune, 18 Nov 2007. ^ "'Ganga is the most polluted river'". The Hindu. 23 November 2003. Archived from the original on 15 September 2008. Retrieved 12 February 2009. ^ 2015, INDIA 2015, New Media Wing. ^ a b PALAEOCHANNELS OF NORTH WEST INDIA, Central Ground Water Board, last page of prefce. ^ Nand, Nitya; Kamlesh Kumar (1989). The holy Himalaya: a geographical interpretation of Garhwal - Yamuna Drainage System. Daya Books. p. 49. ISBN 81-7035-055-7. ^ Sharma, Deo Prakash (2006). Archaeology of Lower Ganga-Yamuna Doab (circa 1200 B.C. to 1200 A.D.). Bharatiya Kala Prakashan. pp. 10, 214. ISBN 81-8090-033-9. "Doab is a Persian word, from Do-Ab, literally meaning 'two rivers', or land between two rivers". ^ At the Three Rivers TIME, February 23, 1948. ^ Sharad K., Jain; Pushpendra K., Agarwal; Vijay P., Singh. Hydrology and Water Resources of India Volume 57 of Water Science and Technology Library. Springer Science & Business Media, 2007. p. 349. ^ Vedic Index of Names and Subjects (V-208-1333-2. p. 186. ^ Gary, Chamberlain. Troubled Waters: Religion, Ethics, and the Global Water Crisis. Rowman & Littlefield, 2008. p. 18. ^ Shiva, Vandana (2006). Earth democracy: justice, sustainability and peace-G - Reference, Information and Interdisciplinary Subjects Series. Zed Books. pp. 172–173. ISBN 1-84277-777-7. ^ Chamberlain, Gary (2008). Troubled waters: religion, ethics, and the global water crisis. Rowman & Littlefield. p. 18. ISBN 0-7425-5245-4. ^ Gopal, Madan (1990). K.S. Gautam, ed. India through the ages. Publication Division, Ministry of Information and Broadcasting, Government of India. p. 72. ^ Dahlaquist, Allan (1996). Megasthenes and Indian Religion- Volume 11 of History and Culture Series. Motilal Banarsidass Publ. p. 386. ISBN 81-208-1323-5. ^ Ghosh, A. (1991). Encyclopedia of Indian Archaeology. BRILL. p. 214. ISBN 90-04-09264-1. ^ Feuerstein, Georg; Subhash Kak; David Frawley (2001). In Search of the Cradle of Civilization. Quest Books. p. 89. ISBN 0-8356-0741-0. ^ Frawley, David (2000). Gods, Sages and Kings: Vedic Secrets of Ancient Civilization. Lotus Press. p. 95. ISBN 0-910261-37-7. ^ Davis, Richard H. (1999). Lives of Indian images. Princeton University Press. pp. 74–76. ISBN 0-691-00520-6. ^ Dimmitt, Cornelia (1978). Classical Hindu mythology: a reader in the Sanskrit Purānas. Temple University Press. p. 329. ISBN 0-87722-122-7. ^ Upper Yamuna River Board Official website. ^ Rao, K.L. (1979). India's Water Wealth - Flood Forecasting system of Yamuna. Orient Blackswan. p. 163. ISBN 81-250-0704-0. ^ Negi, Sharad Singh (1991). Himalayan rivers, lakes, and glaciers. Indus Publishing. pp. 141–142. ISBN 81-85182-61-2. ^ Flood Forecasting Network in India Ministry of Water Resources website. ^ Bharati Chaturvedi, 2010, Finding Delhi: Loss and Renewal in the Megacity, Page 78. ^ ML Ahmed, Analysis of Discharge and Gauge-Level Data at Old Railway Bridge, Int'l Conference on Artificial Intelligence, Energy and Manufacturing Engineering (ICAEME’2014), 9–10 June 2014, Kuala Lumpur (Malaysia). ^ a b c Tak, Prakash C.; Jagdish P. Sati; Anjum N. Rizvi (April 2010). "Status of waterbirds at Hathnikund Barrage wetland, Yamunanagar District, Haryana, India" (PDF). 2 (4): 841. Archived from the original (PDF) on 17 March 2012. Retrieved 10 July 2011. ^ a b c Haberman, David L. (2006). River of love in an age of pollution: the Yamuna River of northern India. University of California Press. p. 78. ISBN 978-0-520-24789-5. Retrieved 2 June 2011. ^ a b c d Too many cooks spoil the broth , The Hindu, 29 March 2016. ^ Woodward, David; John Brian Harley (1987). The History of cartography, Volume 2, Part 1. Oxford University Press US. p. 438. ISBN 0-226-31635-1. ^ a b Yamuna water link may get govt nod, Times of India, 6 April 2016. ^ a b Steamer service to revive navigation in Agra Canal after 143 years, Hindustan Times, 1 Feb 2017. ^ The Ganges and the Jumna The Imperial Gazetteer of India, 1909 v. 1, p. 23. ^ Chaudhary, M., & Walker, T. R. (2019). River Ganga pollution: Causes and failed management plans (correspondence on Dwivedi et al. 2018. Ganga water pollution: A potential health threat to inhabitants of Ganga basin. Environment International 117, 327–338). Environment international, 126, 202-206. ^ Singh, Govind; Deb, Mihir; Ghosh, Chirashree. "Urban Metabolism of River Yamuna in the National Capital Territory of Delhi, India. Yamuna is also one of the most polluted rivers in India". International Journal of Advanced Research. 4 (8): 1240–1248. doi:10.21474/IJAR01/1323. ^ Pepper, Daniel (2007-07-27). "India's "flush-and-forget" mindset". SFGate.com. San Francisco Chronicle. pp. A17–A18. Retrieved 2007-07-27. ^ "CAG castigates Delhi Govt over Yamuna river pollution". Indian Express. April 8, 2000. ^ Daniel Pepper (June 4, 2007). "India's rivers are drowning in pollution". Fortune. ^ "list of head works (Dams,_Barrages, Weirs, Anicuts, Lifts) on Yamuna/Ganga river". Retrieved 14 May 2015. ^ Karthikeyan, Ajitha (September 2009). "Failure of Ganga, Yamuna projects." The Times of India. ^ "Inflow to Yamuna to be cleaned up at last". Indian Express. Aug 31, 2009. Archived from the original on January 14, 2012. ^ Safi, Michael; agencies (2017-03-21). "Ganges and Yamuna rivers granted same legal rights as human beings". The Guardian. ISSN 0261-3077. Retrieved 2019-03-25. Fraser, James Baillie (1820). Journal of a tour through part of the snowy range of the Himala Mountains, and to the sources of the rivers Jumna and Ganges. Rodwell and Martin, London. Haberman, David L. (2006). River of love in an age of pollution: the Yamuna River of northern India. University of California Press. ISBN 0-520-24790-6. Schumann, A. H. (2001). Sustainable regional water management of Yamuna river basin: A case study. International Association of Hydrological Sciences(IAHS). pp. 25–32. ISBN 1-901502-51-1.